Susanne Bier’s first foray into American film is an intimate study of grief and addiction. 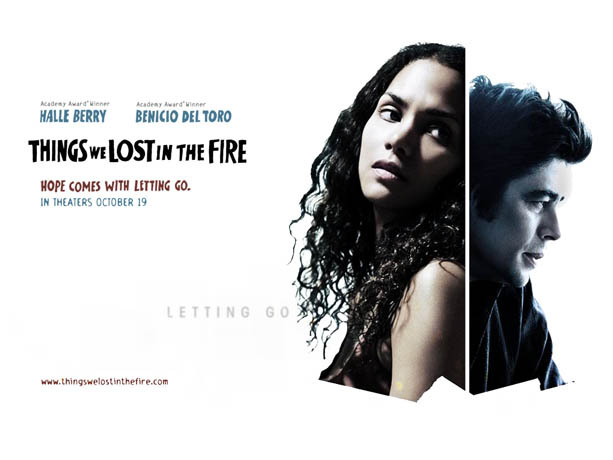 Bolstered by two restrained and very powerful performances by Halle Berry and Benicio Del Toro, Things We Lost in the Fire is a hopeful film showing the connection between two wounded characters as they attempt to stay afloat in a sea of grief. Audrey Burke is a mother mourning the death of her husband Brian, who was killed whilst trying to defend a woman from her abusive partner. She shuts down emotionally and forms a protective shell around herself to protect her young children, Harper and Dory from her own grief. At Brian’s funeral, Jerry Sunborne, Brian’s friend who he attempted to help through his intense heroin addiction, turns up to pay his condolences. Audrey has never liked Jerry and believed Brian was wasting his time in his attempt to help his friend kick his habit. But after seeing how caring he is with her children, she asks him to move into her garage. Her invitation is not a romantic gesture, it is far from that. She just wants someone to be there as she tries to readjust to life after her shocking loss. Audrey and Jerry both have an impact on the other as they connect through grief, heartbreak and addiction. Examined in non-linear fashion, Susanne Bier crafts a moving movie about the need to connect , how powerful an emotion grief is and how we all deal differently we deal with it. Refreshingly in Things We Lost in the Fire, Audrey and Jerry don’t fall in love as is the case with other movies. They connect after initial reluctance and see how much the other meant to the deceased Brian. The intimate screenplay delves deeply into the emotions of grief and anger with moving results. There are occasional times in which the movie lapses into melodrama, but Susanne Bier manages to create a deeply human movie despite the contrivances. Her camerawork is a marvel to watch as it zeroes on the tiniest emotional nuances between Audrey and Jerry. Her use of close-ups of eyes may put some off, but I personally thought it added a personal and subtle impact to the emotions displayed through the eyes. What I admired the most about Susanne Bier’s direction is her scenes of silence in which body language provide us with a heart of the story. The evocative score, mostly composed of an acoustic guitar, is organic and gets to the heart of the subtle emotions on display. Susanne Bier draws two emotionally subtle performances from Halle Berry and Benicio Del Toro. Halle Berry plays Audrey with a subtle emotional core, we watch as she shuts down and keeps her emotions bottled up in order to survive her pain. She doesn’t come across as cold, but rather shielding herself from having to deal with what has happened. When she does let her emotions out, we see all of the anger and suffering she has endured since her husband’s death. It is a moving and convincing performance by Halle Berry. Benicio Del Toro is amazing as Jerry, the drug addicted friend of Brian who is actually a decent man caught in difficult circumstances and attempting to stop his habit. He is by turns caring, frightening but above all sympathetic as we see how Brian never gave up faith on his best friend. As the deceased Brian seen in flashback, David Duchovny is reliably warm-hearted as the good guy whose life ended tragically. In small but effective roles, John Carroll Lynch and Alison Lohman play an unhappy neighbour and a recovering addict. Hopeful, filled with deep emotion and two stunning lead performances, Susanne Bier’s Things We Lost in the Fire is a drama of emotion and recovery that is moving and movingly observed. Wow! Sounds very interesting. I can’t believe I haven’t heard of it especially considering the cast. Fantastic review. Thanks Keith, I know I was surprised that this one seemingly evaded me. I really liked this film a lot, especially Del Toro’s performance. I actually like what Bier does with dramatic material, although I know many don’t. She’s a great talent. Nice write up! Thanks for the comment, Del Toro is such a gifted actor and Susanne Bier is great at making intimate movies based around deep feelings. Sounds promising. I’ll check it out. Thanks, let me know what you think of it. Thanks for the positive comment, hope you get round to seeing it. Wow! Missed this one. Sounds like a good one. Nice review, Vinnieh. Thanks Cindy, it is a good movie and features some excellent performances. If you think about it, this is probably one of Berry’s last “good” performances, as she hasn’t really done much since this. Nor has she done anything worth watching since this either. Good review Vinnie. Thanks, yeah she hasn’t been in anything that good lately but her performance in this film was amazing. This is is Berry’s another Oscar hopeful but misfires (as usual), but you review does make me intrigue to it! Thanks, you should watch it, Berry and Del Toro are really good in it. Nice write up. Curious to see this. Thanks, it is very underrated in my view. Thanks for writing up this review! I remember seeing the preview for the movie a couple years ago and feeling intrigued. I have no doubt that Halle Berry was very good – she often doesn’t get enough credit for her acting skills, in my opinion. Thanks for the comment. I agree she is very good as an actress, but some of her roles haven’t showcased her abilities. Nice review. I didn’t really know anything about this one. And I see Alison Lohman is in it – I’ve always liked her but don’t see her in much. Thanks for the comment, it’s a film that seemed to slip under the radar. Great review. I really need to give this one a rewatch, if for no other reason that Del Toro’s performance. You’re right, he’s simply amazing as Jerry. Such torment. Thanks, Del Toro is always such an amazing presence on screen, he really gets to the heart of his characters. This has been on my list of movies to see since its release, going to have to go rent it now. Thanks for the convincing with the nice review. Thanks, let me know what you think when you see it. I haven’t seen this one. But as I could happily watch Benicio reading a newspaper, I will have to check it out soon. I too could watch him do anything and it would be excellent. I’ve heard of this, but haven’t gotten around to watching it yet. Thanks for this Vinnie! It’s a vastly underrated drama Kim. The acting is of a very high standard, which makes it surprising that the film isn’t better known.